U.S. Air Force Staff Sgt. 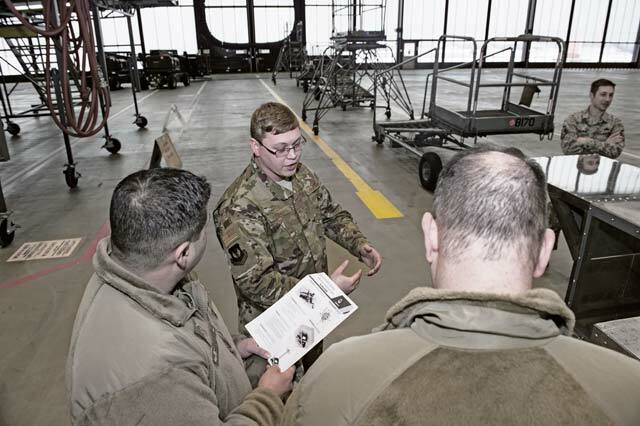 Justin Cupit, 86th Maintenance Group facility manager (middle), discusses details regarding a construction project with the 86th Airlift Wing command team in the dual bay hanger on Ramstein Air Base, Jan. 24. August awarded Cupit as the Airlifter of the Week for his efforts in maintaining more than 40 86th MXG buildings worth more than $60 million. Staff Sgt. Justin Cupit, 86th MXG facility manager, had no idea Brig. Gen. Mark R. August, 86th AW commander, and Chief Master Sgt. Ernesto Rendon, 86th AW command chief, were on scene to coin him for his efforts. As the 86th MXG facility manager, Cupit is in charge of 44 buildings worth more than $60 million. Cupit works with 86th MXG leadership to oversee the status of building construction projects. His dedication to his duties reassures flightline and support maintenance personnel, so that the 86th MXG is capable of generating world-class airpower. The Airlifter of the Week program recognizes Ramstein Airmen, who through hard work and dedication, make the 86th AW the World’s Best Wing. U.S. Air Force Staff Sgt. Justin Cupit, 86th Maintenance Group facility manager (right), discusses plans to install a fall prevention system with U.S. Air Force Brig. Gen. Mark R. August, 86th Airlift Wing commander (left), and U.S. Air Force Chief Master Sgt. 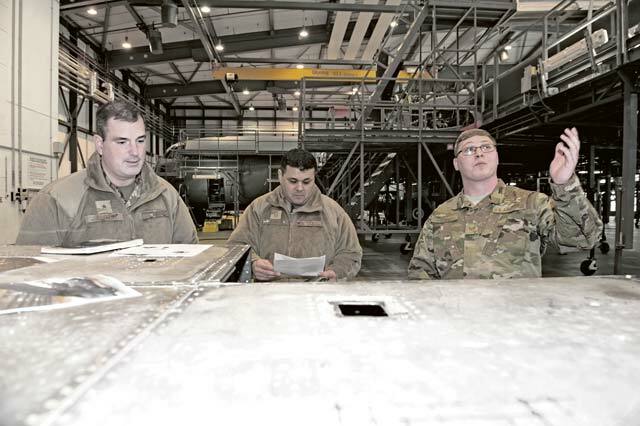 Ernesto Rendon, 86th AW command chief (middle), in the dual bay hanger on Ramstein Air Base, Jan. 24. August awarded Cupit as the Airlifter of the Week for his efforts in maintaining more than 40 86th MXG buildings worth more than $60 million.